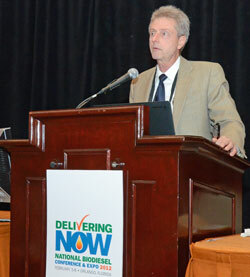 The keynote address at the Sustainability Symposium was given by Stephen Kaffa, California Biomass Collaborative. His keynote outlined the major environmental, economic and social factors impacted by our choice of fuel. He said it’s a big topic to cover in a short period of time and started with the “easy” part. He asked if everyone agreed on the three pillars of sustainability which are that agriculture or biomass production should be environmentally sound, economically profitable and socially just. Everyone agreed.